Homemade bread pudding with fresh raspberries, fresh whipped cream, and a delicious vanilla sauce. 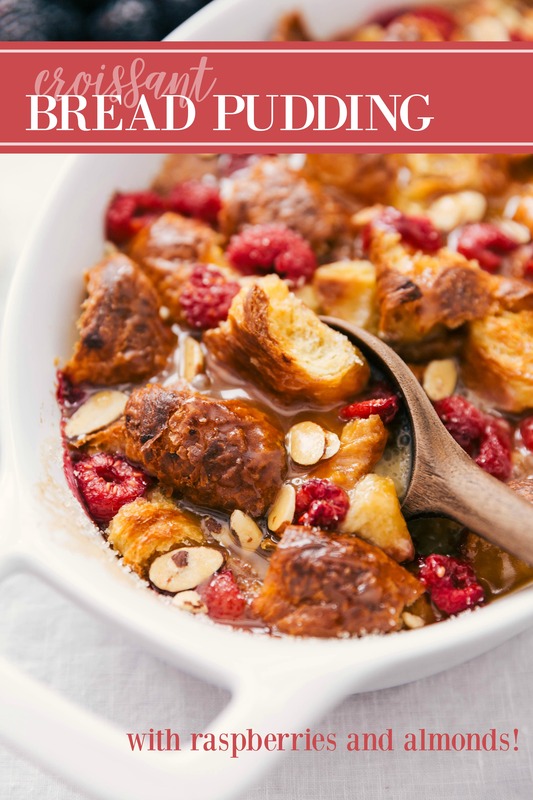 With an easy prep time and tons of ideas to customize, this bread pudding recipe will quickly become your favorite! 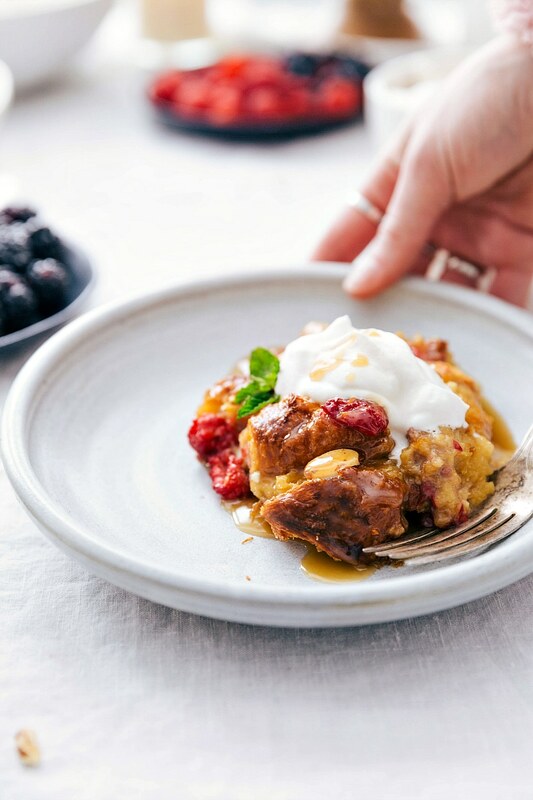 This bread pudding is one of those recipes you’ll want to whip out whenever you’re serving a brunch or fun breakfast. 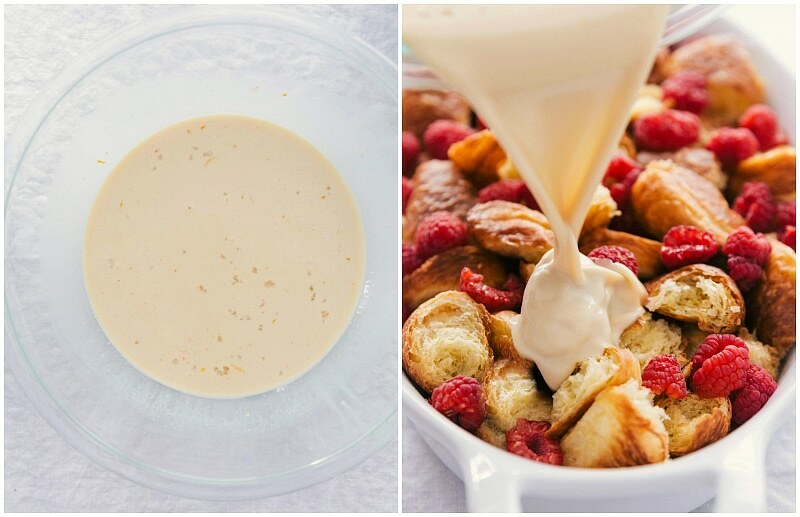 Learn all my tips and tricks to make a super flavorful, custardy, and creamy bread pudding. 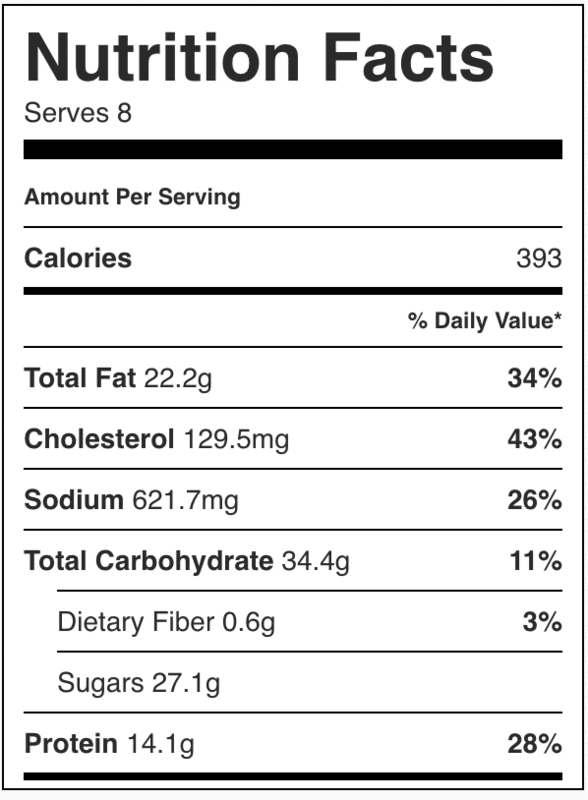 For years and years I hated bread pudding. I tried it every now and again wondering what I was missing because everyone else seemed to be obsessed. It wasn’t until I was in my early twenties I finally had a bread pudding that converted me. 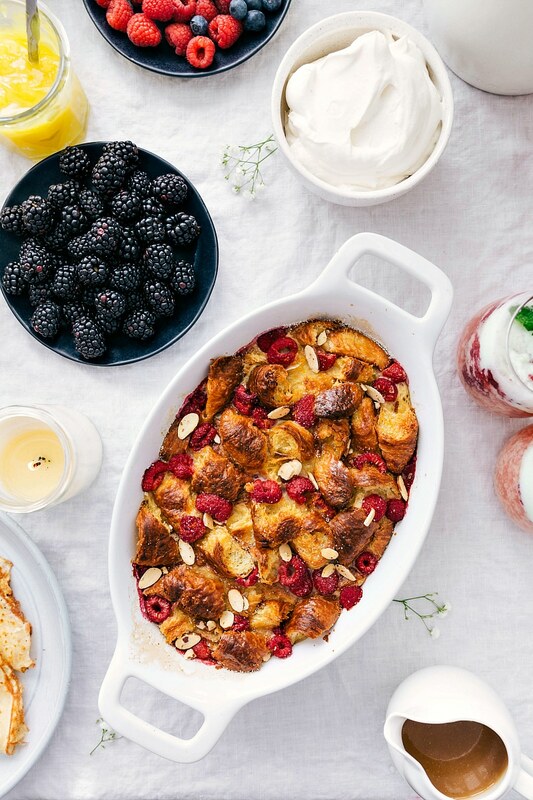 At the restaurant I was working at, we threw a special brunch for Easter and that day a raspberry croissant bread pudding was served. After hearing about it ALL day and a bit of convincing from co-workers, I reluctantly tried the bread pudding. It was insanely good! And I’m pretty sure at the time I claimed it was the best thing I’d ever eaten! For years I’ve tried to replicate that bread pudding and I’ve come close, but never got it exactly right until now. 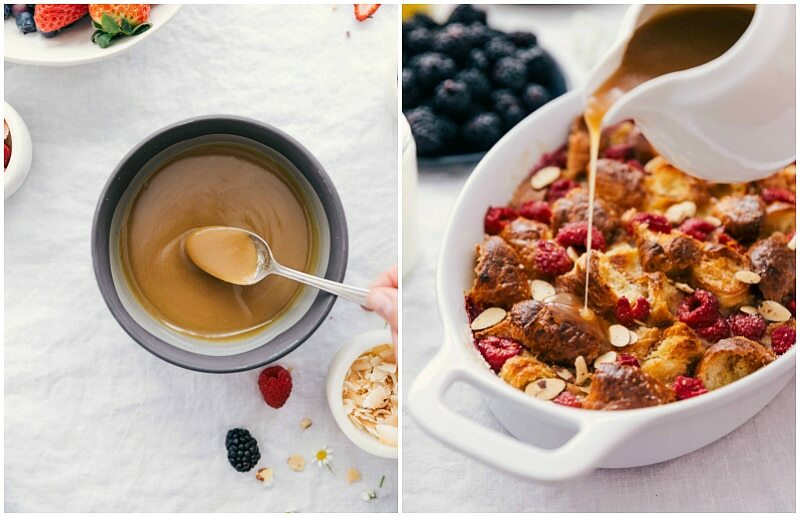 I’m so excited for you to try this bread pudding recipe! First off, we’ll talk process, then ingredients, and finish with some tips for this bread pudding recipe. How do you make homemade bread pudding? Toast the bread: bread pudding is best with stale or day old bread, but you can make it with fresh bread as well. Whatever you’re using, you want to dry out the bread to ensure it will soak up the custard without becoming overly soggy. Make the custard: for this custard, we’re keeping it simple — you don’t even have to warm everything through or scald the milk for this recipe. Simply whisk together milk, cream, sugars, extract, salt, and orange zest. Toss this custard with your dried out bread cubes. Chill the bread pudding: after everything is combined, the bread pudding needs some time for the bread to absorb the custard and to get nice and cold before going into the oven. Cover and chill for 45 minutes to 1 hour. 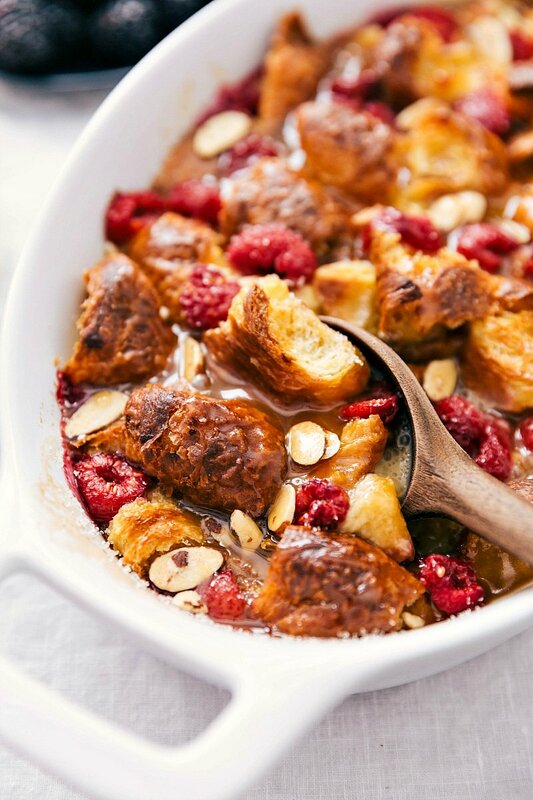 Bake: Remove the bread pudding from the oven and bake. Serve with whipped cream and a vanilla sauce: while this bread pudding recipe is delicious on its own, there is nothing like a spoonful of whipped cream and vanilla sauce drizzled on top! Sturdy bread: since the bread is getting soaked in a custard you want to make sure the bread won’t disintegrate. We toast the bread and use large pieces which helps avoid a soggy pudding. Taste: obviously bread pudding relies on bread as the main ingredient so you definitely want to make sure the bread itself tastes delicious. Most bread pudding recipes include (obviously) bread, eggs, and some kind of milk/cream mixture. I include a few “secret” or unique ingredients that really takes this bread pudding recipe over the top! Orange zest: while it might seem unassuming, the orange zest brightens this dish immeasurably. It, along with the raspberries, help to cut the richness. Vanilla extract: a good vanilla extract also adds a lot. If you happen to have a vanilla bean, scrape out the seeds and use in the custard for an even better vanilla flavor throughout the pudding. Coarse sugar: an optional addition, but adding a couple of tablespoons coarse sugar to the top of your bread pudding adds a fun crunch and flavor. Honey roasted almonds: another optional addition, but these honey roasted almonds (found at most grocery stores) sprinkled on the baked bread pudding adds another delicious flavor element. Use fresh berries: avoid frozen berries as they tend to dye the bread pudding and make it soggy. While raspberries are our go-to choice, blackberries or blueberries are delicious as well. Rip the croissants: instead of cutting up the bread with a knife, ripping the croissants allows for more ridges to soak up the custard. Use the right size pan: it really depends on how you like your bread pudding. For a softer, more custardy texture from top to bottom use an 8 x 8 pan. If you want to maximize the top layer for a crispier top, use a 2-quart shallow baking pan. My family definitely prefers the shallow pan! 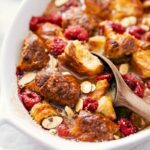 A delicious bread pudding recipe with fresh raspberries, fresh whipped cream and a delicious vanilla sauce. Preheat oven to 300 degrees F. Lightly grease (with cooking spray) a 2-quart baking dish. 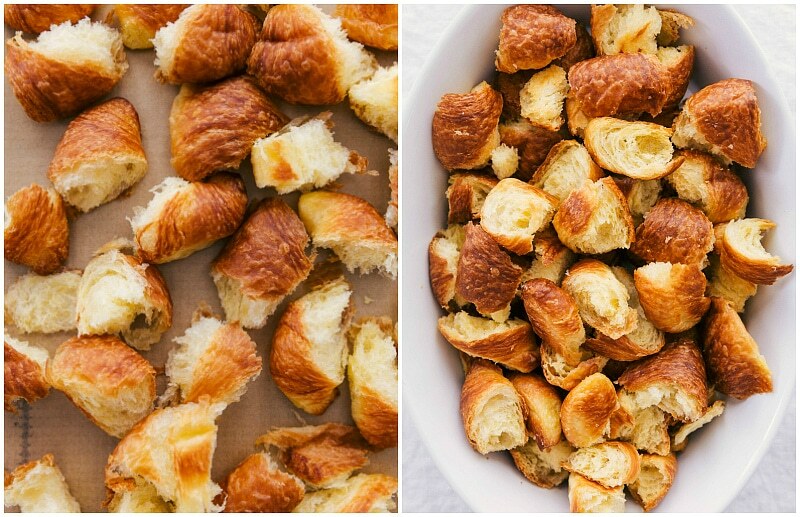 Rip up croissants into 1-inch pieces and place them on a sheet pan lined with parchment paper. Bake, tossing halfway through (and reducing oven temperature if bread is getting too golden) until pieces are very dry and slightly toasted, 15-25 minutes. (The dry croissant pieces will absorb the custard without disintegrating, which is why this step is important.) Let cool, then transfer to the prepared 2 quart baking dish. Meanwhile, in a large bowl whisk together the milk, cream, brown sugar, white sugar, egg, egg yolk, vanilla, salt, and orange zest. Whisk until combined and smooth. Place the toasted croissants in a 2 quart baking dish (*I like something more shallow/surface area than an 8 x 8 inch pan, but an 8 x 8 inch pan will work -- it will be more creamy/custardy). 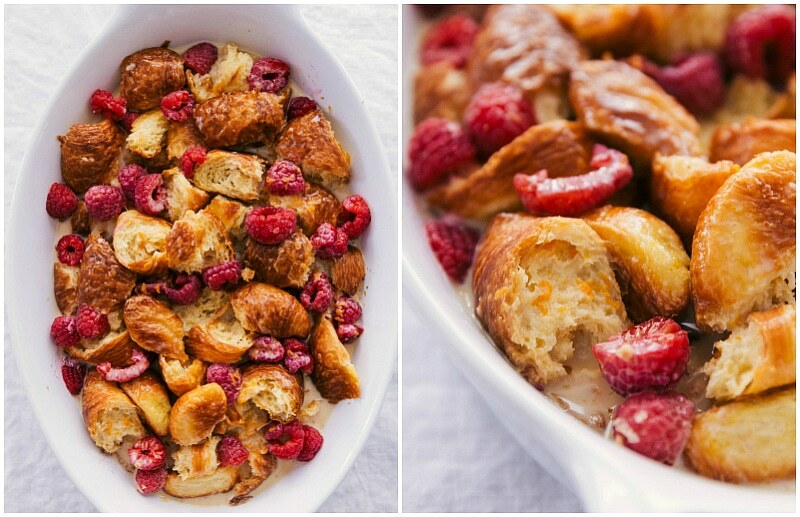 Sprinkle halved raspberries across the top of the croissant pieces. Pour the liquid over the croissants and press the pieces down to be submerged in the liquid (to avoid burning croissants). Cover with foil and refrigerate for 45 minutes to an hour. Remove the foil and gently press down croissants into liquid. If desired, sprinkle on the 2 tablespoons coarse sugar. Bake for 35-45 minutes or until custard is firm and set (bake time will be a bit longer for an 8 x 8 pan). If needed, tent the pudding with foil to keep the top from burning. If desired, sprinkle almonds on top. Whipped cream: add the ingredients to a stand mixer with the whisk attachment and mix on high speed until stiff peaks are for formed. Chill until ready to serve. Vanilla sauce: combine all sauce ingredients except vanilla in heavy bottomed pot. Cook over medium heat, stirring occasionally, 5-8 minutes or until mixture thickens and then comes to a full boil. Remove from heat and allow to slightly cool. Stir in the vanilla. Top individual servings of warm bread pudding with whipped cream and vanilla sauce. Best eaten same time/day as prepared. This bread pudding is seriously devine. It Is the hit at every brunch I bring it to. Throwing my niece a baby shower next week and this is at the top of my list to make. Thanks so much! I’m so glad you enjoyed! Thank you so much and good luck with your baby shower!